Africa and the Middle East are about to get the world's thinnest CRT TV set. Just when we thought the festering corpse had twitched its last , the CRT television leaps up and scares the daylights out of all of us by demonstrating that there's life in the old box yet. Specifically, Korean firm LG has announced that it has developed the world's slimmest CRT set and that it will be available in select markets later this year. Details are still sketchy but it's obvious from the blurry press photo LG supplied that the upcoming 21FU1R TV set could easily be mistaken for an LCD when viewed from the front. Even the back of the TV has been pared down to nothing more than a small bump. Although the newcomer is only 21 inches across the diagonal, it's destined to be cheap enough to make it a realistic alternative to small flat-screen models. 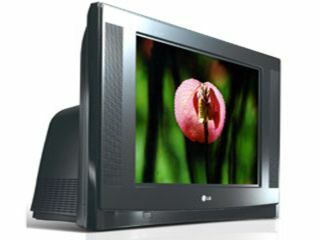 LG skips the specifics but says that when it sells the CRT in its target African and Middle-Eastern markets it will be "Around 75 percent cheaper than an LCD TV", which makes it likely to cost around £75 in our book.